Suri piqued my interest in part because she has published her first book — a book with universal themes but with distinctively Orthodox characters and setting — with a mainstream, secular publisher. Most books with Orthodox themes tend to be published by Jewish publishers. I conducted this interview last week via email. RK: This is your first novel, but as many of the reviewers have noted, you write with real skill. In particular, you handle Rain’s voice with humor and confidence.​ Have you published other genres before, taken classes, or to what else do you attribute your success? I read numerous books and blogs about writing and spent countless hours discussing technique with other novelists. But the most important aspect of becoming a publishable author – to me – is getting feedback. Giving a critique also sharpens your craft but getting a critique to me is the single most important factor in developing yourself as a writer. And it can be brutal! In my blog post, The Five Stages of Critique Misery, I discuss the legendary five stages (Denial, Anger, Bargaining, Depression, Acceptance) as a completely accurate description of the process. SR: I started by joining a private online critique group. It included some experienced authors, and their critiques of other manuscripts were very illuminating. From there I started cultivating my own critique partners – some published and some not quite there yet. The internet can be a great way to meet crit partners. One of my current beta readers is an ex-Marine who now works in counter narco-terrorism! She gave me excellent feedback for Playing with Matches, and I’ve critiqued a number of her manuscripts. I met her on Absolute Write which is an excellent resource for writers. Did you always intend to publish via a mainstream publisher, or did you originally think you’d publish through a Jewish one? SR: Now that is a whole megillah! It was first intended to be an Orthodox book. I sent off 20,000 words to an old friend at a large Jewish publishing house. She loved it and for the next two years prodded me to finish it. At the time I was writing a middle grade novel for a television series I was developing with a production company as well as attending graduate school. When I finally got back to this manuscript, the reality of how epic the project was made me re-think my market. I consulted with my wise writer woman Marsha Skrypuch. She does a lot of historical fiction (genocide in Armenia and Ukraine) and she felt that this story was indeed a mainstream one, so I wrote about the community with a non-Jewish audience in mind. A number of my critique partners are not Jewish, which helped ensure that it was comprehensible. I didn’t want to go heavy on the explanation because I needed to maintain the fast pace. But when the manuscript was complete and I started querying agents, three of them told me that the Jewish angle would make it a tough sell, believe it or not. So…I “de-Jewed’ it! Or as my doctor said, wrote the Gentile Edition! But the whole matchmaking thing really didn’t work- the context was wrong. When I met with my publisher, he encouraged me to write the book that it needed to be. Then, I “re-Jewed” it. My first editor wanted more religious content, which I reluctantly put in. The publisher then wanted less, so I took it out. As you can see, it was not a simple matter to set the Jewish content to the correct level! RK: I think that you really hit the exact balance the book needed. There’s enough Jewish content to establish the setting and make the matchmaking and so on comprehensible, but not so much that it takes over the book. It’s a real testament to your success that the reviews I read of your book are almost exclusively by non-Jewish readers and have universally been good. 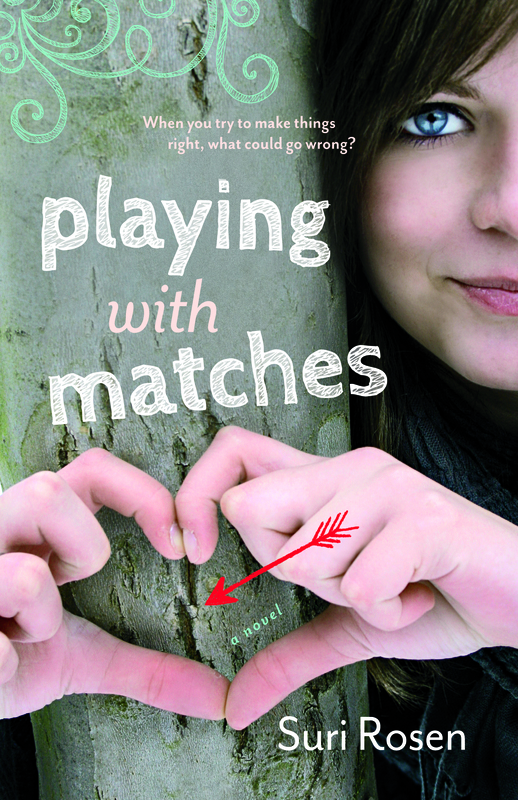 We’re in the midst of the High Holidays right now, and as I read “Playing with Matches” I found the end really addressed the concept of teshuva, but without the lingo you might find in a specifically Jewish book. Was this focus intentional? Have other readers picked up on it? SR: Okay, you totally got it. It’s absolutely a story of Teshuva! Rain starts off in the story somewhat shallow — even cruel. But her lack of social status in her new school forces her to evolve as a human being. Her focus changes and centers on making amends. Her reflections on apologizing are also a comment about Yom Kippur. (Okay, so they’re my reflections on Yom Kippur.) Waiting to apologize right before Yom Kippur on one level is a beautiful opportunity. But let’s face it – it’s also self-interest. Apologizing immediately after hurting someone is about healing the wounds you’ve inflicted on someone else. For Rain that’s a tremendous eureka moment of self-awareness. And thanks for your vote of confidence on the Jewish content. It was such an overwhelming challenge and as you pointed out, nobody’s complained about not ‘understanding’ the context. RK: What struck me about Rain’s “eureka moment” is that even though her character is Jewish, the setting is Jewish, she goes through a nearly universal experience. So many teenagers or twentysomethings have that moment where they suddenly realize the world is not all about them. That realization is transformational, because it allows them to extend beyond themselves. What led you to focus on that transformational moment of teenage-hood? SR: You’re absolutely right that the experience is a universal one! I’d say that in life that transformational awareness is often more of a process than a moment. But in fiction you can condense and accentuate that experience for dramatic effect and for heightened insight. To me one of the most satisfying aspects of young adult literature is the sense of figuring things out; emotional boundaries, one’s place in the world, and family relationships. The coming-of-age experience is a microcosm of the maturing and deepening process and I find those stories so satisfying to read about! RK: Did you find yourself more inspired by your own teenage years, or of people around you? SR: Ha! My teenage years weren’t very inspiring! I just love quirky, funny, and engaging scenarios and stories. If you had to pick one book about writing for a new writer to read, what would it be? SR: I would suggest Plot & Structure: Techniques and Exercises for Crafting a Plot That Grips Readers from Start to Finish by James Scott Bell. I’m working on two novels: one is an upper-middle grade that has a touch of supernatural. The other is a coming-of-age YA thriller (I know, strange combination) that’s much darker than the others.Thanks for the great interview. You ask great questions! If anyone has a question for Suri Rosen, please comment! Great interview, Suri, and congratulations on this fab novel! It really is such a fun read, the kind that just flies by, and then you realize at the end it was more than fluff.